What is a Stress Echocardiogram? An echocardiogram is a painless, harmless test that uses high frequency sound waves (ultrasound) to examine the heart’s anatomy and function. A treadmill stress test evaluates your heart’s response to physical activity through the monitoring of your heart rate, blood pressure, and electrocardiograms while you exercise on a treadmill. When the two tests are combined, an assessment can be made of the status of your heart at rest, as well as during and immediately following stress. This can provide your doctor with information regarding whether or not you have significant blockages in your heart arteries. Other information obtained includes an assessment of the pumping function of your heart and the status of your heart valves. To determine if coronary artery disease is present and if further studies and /or treatment are required. To evaluate progress following a major cardiac event (heart attack, heart surgery, etc.). To investigate the effort of exercise on heart valve function. The entire test will take approximately 1 hour, although you will be walking on the treadmill for approximately 10 minutes of that time. The stress test will be performed in a stress test laboratory by specially trained medical providers. You will be asked to disrobe from the waist up and will be provided with a gown to wear allowing a small area of your chest to be exposed. Electrodes will be placed on your chest and wires will be attached to the electrodes so that the electrocardiogram (ECG) can be monitored continuously during the test. In men, limited shaving of the chest may be required to assure good contact between the skin and the electrodes. A blood pressure cuff will be placed on your arm so that your blood pressure can be measured before, during and after exercise. Next you will be asked to lie on an examining table and the sonographer (a specially trained ultrasound technologist) will obtain ultrasound pictures of your heart using a small hand-held transducer and water-soluble gel. The lights will be dimmed to reduce glare so that the sonographer can better see the picture monitor. The pictures obtained during the ultrasound examination will be recorded on a videotape. You will then walk on a treadmill, which is an electrical walkway that can be raised. The speed and incline will increase gradually, such that you will be walking uphill. Your blood pressure will be checked intermittently and from time to time you will be asked if you are experiencing any symptoms. You will be encouraged to exercise for as long as you can. If you notice chest pain, dizziness, weakness, lightheadedness, or leg fatigue, say so as soon as any of these symptoms occur. Immediately after stopping exercise, you will be helped quickly back onto the examining table and the sonographer will again take ultrasound pictures of your heart. You may be asked to hold your breath for short periods during this time so that the best possible pictures can be obtained. Ideally, the post-stress pictures are obtained within 1 minute of stopping exercise. 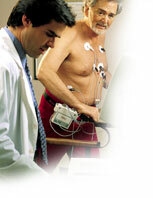 You will continue to be monitored until your heart rate and blood pressure returns to pre-exercise levels. DO NOT eat or smoke for 3 hours before the test. You may drink water. Do take your usual medications with water, unless instructed otherwise by your doctor or nurse. Diabetics who use insulin or glucose lowering agents may need to adjust their dosage. Please check with your physician if you are not sure. Do wear loose fitting clothing that allows easy access to the chest, and comfortable walking shoes. Stress testing is very safe. The likelihood of a serious complication (such as a heart attack or death) is less than 1 in 10,000. It is important to keep in mind that you will be continuously and extensively monitored throughout the test by experienced personnel and that the test will be stopped if there is any indication that continuing exercise would be unsafe in any way. 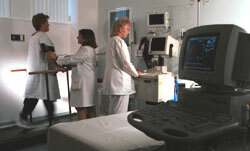 There are no reports of complications related to the use of diagnostic ultrasound. Cardiac Symptoms: Hypertension, chest pain, murmur, syncope, arrhythmia, suspected coronary artery disease, valvular heart disease, endocarditis, pulmonary disease, cardiac masses, evaluation of ventricular function, stroke, peripheral emboli involving major arteries, and family history of genetic cardiac disorder.